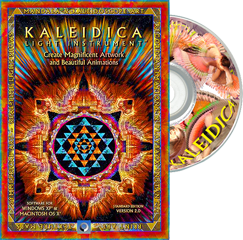 The KALEIDICA Version 2.0 (both Mandala and Pro Editions) includes CD-ROM (for both Macintosh OS X and Windows XP), Installation Instructions and Hot Key List. All Documentation is included on the CD-ROM as a printable Adobe Acrobat® (.pdf) file. Fishrock Studios guarantees that you will be 100% satisfied with your purchase of the Kaleidica Light Instrument or we will gladly return your cost minus original and return shipping. Shipping charge is $7.00 in the USA and $10.00 for any international destination. The Kaleidica will ship within two business days of your order. All USA orders ship US Postal Service Priority Mail (usually arrives within two business days). International orders ship via international first class air postage. We process all Kaleidica purchases through PayPal Services (paypal.com). It's the most secure way to purchase Kaleidica because no one ever sees your credit card information. It's all handled automatically by PayPal. When you add The Kaleidica to your shopping cart using the BUY NOW buttons, you can use your Visa, Mastercard, Discover or American Express cards. If you have an account with PayPal you can pay directly from your PayPal account. $49.00 (US Dollars) plus $7.00 shipping and handling in USA and $10.00 for international purchases (we ship worldwide). (California residents add 7.625% sales tax ~Total for CA residents $59.74). All purchases of The KALEIDICA are handled securely via PayPal. By using PayPal you can purchase The KALEIDICA with any of the above credit cards or by using your PayPal account (if you have one). You DO NOT need a PayPal account to make this purchase. $259.00 (US Dollars) plus $7.00 shipping and handling in USA and $10.00 for international purchases (we ship worldwide). (California residents add 7.625% sales tax ~Total for CA residents $285.75). $210.00 (US Dollars) plus $7.00 shipping and handling in USA and $10.00 for international purchases (we ship worldwide). (California residents add 7.625% sales tax ~Total for CA residents $233.01). Buyers of the Upgrade must provide a valid product key (for their Standard Edition), name, address, phone, and email. The KALEIDICA, The KALEIDICA Light Instrument, and Fishrock Studios are trademarks of Fishrock Studios. Copyright © 2000-2013 by Fishrock Studios, All Rights Reserved.